This is the third (and probably last) version of a proposed restructure of bus routes following the completion of Northgate Link. This builds on the other two posts. As with the other two maps, this focuses on all-day service. I still expect some express buses to provide additional connections or coverage. Make the buses faster by avoiding turns, or congested areas. Enable straightforward trips from anywhere to anywhere. Provide fast trips to a nearby Link station. Make it easy for people to get to the UW. Match service with demand. This applies not only to individual routes, but corridors that share sections with multiple routes. Favor more densely populated areas over less densely populated ones. The first two goals are achieved best by building a grid with frequent service. Not only is this difficult for this part of town (because there aren’t many east-west arterials) but it conflicts with some of the other goals. Link stations don’t always fit nicely on a grid. To get to Northgate Station, for example, you need to make several turns (from any direction). 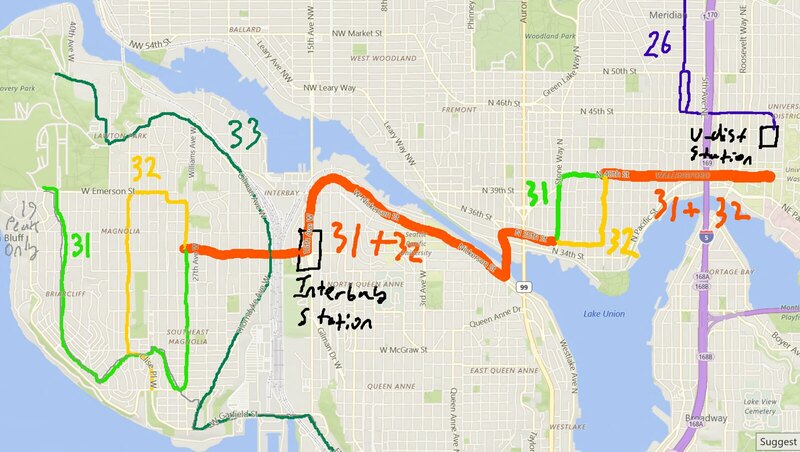 UW Station is particularly difficult to get to. But the UW is a major destination in its own right, and should have direct service from nearby areas. This is why I’ve tried to give apartment dwellers in the area both a one seat ride to the UW as well as a fast, direct bus to a Link station. 65/66 — The Wedgwood/Ravenna area is one of the bigger sticking points. At first glance, simply running the existing 65 and 62 should be adequate. The problem I have with this is that riders on 35th NE — or at least those not close to NE 65th Street — would continue to endure a time-consuming trip to Link. I also don’t like the northern tail of the 71/76. It is obviously designed for coverage, but it serves low density areas before high density ones. Variation 1 — I address both these issues with this proposal. The bulk of the apartments along 35th are north of 65th. Those riders would have a fast connection to Link, as well as good connections to additional bus service. For example, a trip from Wedgwood to Greenwood would involve a two seat ride through Roosevelt (instead of through the UW or Northgate). The 66 helps fill the gap left by the change. It provides for a good network in the area, as well as direct service to the UW. The tail of the 66 is messy and similar to the tail of the 71/76. But it is actually significantly shorter than the existing 71/76, while providing almost as much coverage. The layover area is part of the existing one way loop, saving some time. The best part about the new loop is that low density areas are closer to the tail. In that regard, it is similar to the all day 24 (which serves low density West Magnolia last). Thus coverage riders at the end of the line may be costing Metro some service time, but they aren’t delaying other riders. This particular combination also has the tail going to a different location than service along 65th, thus picking up more riders. If you are at View Ridge Park (equidistant to the 65 or 66) you would walk to the 66 if you are headed to Children’s or the the UW. 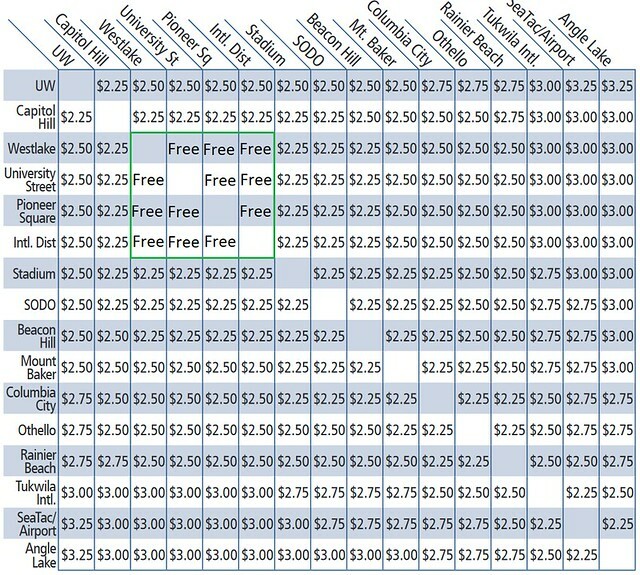 From a service standpoint, I think the 65 would run more often than the 66 in this variation (as more people are headed to Link instead of the UW or Children’s). Variation 2 — This is more closely aligned with current routing. The 65 is unchanged. The 66 has the new tail but is otherwise similar to the 71/76. This is a reasonable trade-off that keeps most of the existing network, while allowing a lot of the people on 35th to have a fast ride to Roosevelt. Frequency becomes a bit more challenging. With this combination, I think the 66 would be more popular and thus run more often (since it provides for a faster connection with Link). This would have the downside of running the tail of the 66 quite often, unless they ran a truncated version of it (like the 3 to Madrona). It also means that the current 65 is running way to often for what it provides (a connection to the UW and Children’s). Variation 3 — This is a very lean and fast routing. The tail is gone, and people in that area simply have to walk a bit farther. The 65 would provide a connection to Children’s and the U-District. Thus the connection to Link may not be as fast as if the bus went to Roosevelt, but it is still a lot faster than today. You also double up service between Children’s and the U-District (and thus the fast connection between Children’s and Link). You lose some of the service between Children’s and the south end of campus, which is a natural connection between the two medical areas (and largely the justification for the existing 78). As with all of the maps, I prefer the first option. Variation 3 saves service hours, but I don’t think it is worth it. I believe the first variation allows for a very good matching of demand to service. The new 65 doubles up service along the densely populated part of 65th, while giving the vast majority of people along the 35th corridor a fast ride to Link. A bus like that would be popular, and thus frequent. Service along the southern part of 65th is less important, but still strong enough — and short enough — to justify 15 or 20 minute frequency. You still have coverage for View Ridge, but it doesn’t cost you that much, because the bus doesn’t run that often. It also serves a different area, which means that it may attract those who are willing to walk a little further for a one seat ride. 346 — This change follows the move of the 26 to 5th Avenue Northeast in the previous map. While that provides good coverage and a faster connection to Northgate, it breaks the connection between the North Seattle College area and Green Lake (or the area and the 45). This puts it back. But there is a cost, as now service from Northgate to North Seattle College (and the surrounding area) is less frequent. I believe the combination of the new pedestrian bridge, the existing 345 and the new 40 (serving Northgate Way) is adequate to serve this connection. If not — if this is simply too much walking — then the 40 could follow its current route. I’ve kept the 345 going to Northgate because it provides front door service to Northwest Hospital. This means that folks who don’t (or can’t) walk that far still have existing service. You do lose the frequent connection between other parts of Meridian and Northgate. But in return, you get a connection from Meridian to Roosevelt. This means that getting to Northwest hospital (or anywhere along Meridian) is a lot easier for a lot of riders (in Roosevelt, Sand Point, Greenwood, etc.). The variations all deal with the southern tail. Variation 1 — This follows the 45 to Roosevelt. The only reason I prefer this is because of congestion along 80th, close to the freeway. It is not clear where this bus would layover (it is possible it could tie into some of the 65 buses coming from the east). Variation 2 — This follows part of a route proposed in Metro’s Long Range Plan. This covers all the bus stops from the old 26. I don’t think the coverage is that important, but it is nice to have the bus loop around and layover under the freeway. Variation 3 — This is a combination of the above two concepts. It avoids the traffic on 80th, but has a nice layover. The 522 should have more bus stops along Lake City Way. The stop on 20th/85th is the second most popular bus stop on this route, north of downtown (exceeded only by the stop at 125th and Lake City Way). Riders along the corridor aren’t just going downtown, either. About 10% of the riders on the 522 are going from Lake City Way (within the city) to places north. As the population increases, so will rides of that nature. It would behoove Sound Transit to add more stops along Lake City Way. At a minimum, the route needs a stop at 80th and 15th. Likewise, I consider 95th essential, as the 372 does not serve that area, making some otherwise close walks to the bus stop cumbersome. I would consider 98th optional but would definitely add a stop at 110th. 115th and 120th are optional, as those riders could take a frequent bus to Northgate (even if it is a bit slower). Metro (and Seattle) might have to negotiate with Sound Transit to add as many stops as possible. Adding three stops (80th, 95th and 110th) would still have wide stop spacing, while providing Seattle riders with a good connection to Link as well as the areas along State Route 522. I used this map to figure out where the apartments are, and where they are likely to be built in the future. It isn’t perfect, but I’ve found it to be the easiest way to get an idea of where the density is. Until 2012, Seattle had the Ride Free Area, a certain section of downtown Seattle (including the entire DSTT) where one could board any bus through any door, exit any bus through any door, and not have to pay a fare. Funded by the city of Seattle, this was meant to make it easier for people to get around who couldn’t afford a fare, to make it more feasible to make short trips through downtown without a car and without needing to pay full fare for a short trip, and to speed boarding in the busy downtown core and the DSTT (which, at the time, also had bus service in addition to Link). In practice, this resulted in a complex payment arrangement, where you sometimes pay when you board, and sometimes pay when you exit, depending on which side of the RFA your bus was on. And because King County Metro ran many bus routes into downtown Seattle from every part of the county. You could take a bus from Eastgate to Issaquah, or the Federal Way Transit Center to Twin Lakes Park and Ride, and need to pay when you exit if you are taking a bus that happens to be originating in Seattle. This created lots of confusion, and many people just paid as normal, and some undoubtedly exited the bus at the back door without the operator noticing and evaded their fare. The RFA applied to everything but light rail trains (and I think the Seattle Streetcar as well), which is weird since that is the easiest mode to make free for a specific area. With buses out of the tunnel and trains remaining at 10 minute frequency midday, most of the intra-downtown trips in the DSTT will move to third avenue, overcrowding the already busy corridor and under-utilizing the tunnel. ST is not likely to add midday frequency to the tunnel until East Link opens in 2023, so that leaves four years of significant under-utilization of the tunnel. One solution that both increases utilization of the tunnel and achieves the goals of the RFA? Make train trips within the Downtown Seattle Transit Tunnel fare free. Making a “ride free area” is easy to do with trains; simply make all trip pairs within the tunnel fare free, and don’t do fare enforcement in the tunnel. Riders who are riding within the tunnel don’t need to tap their card at all, and this can make it easier to catch a train if they are in a hurry. This will also increase throughput a little bit during rush hour. It provides an incentive to wait for the train during off-peak hours, since it might take a little more waiting, but you can get a free ride for the wait. And it makes things quicker for fare enforcement, which doesn’t need to check every rider on a train within downtown, but can simply wait until a train exits Westlake Station or International District/Chinatown station, and check riders which are still on the train. There could also be an automated reminder that if you didn’t tap their card, then you need to deboard, tap, then wait for the next train if you wish to continue past the tunnel, which should minimize confusion and give people warning before they are subject to fare enforcement. This would also move some impromptu trips off of busy third avenue, and make better use of the tunnel. What is the average percentage of end of journey layovers to total time for King County Metro drivers? This question is prompted by the 269 Saturday schedules. This service was introduced in March 2018 between the park and rides at Bear Creek and Issaquah Highlands, perhaps about half the length of the weekday 269 between Overlake Park and Ride and Issaquah Transit Center. The first Saturday bus departs Bear Creek at 8.35 am and arrives at Issaquah Highlands at 9.06 am, 31 minutes later. After a 9-minute layover the return journey commences at 9.15 am and reaches Bear Creek at 9.47 am (32 minutes) which allows a 19-minute layover before the next journey at 10.06 am. Thus, three vehicles are required for the approximately headway of 30 minutes between buses. This is just half of the midday six-bus allocation for the longer route of weekday service. The 10.06 am journey takes 34 minutes to get to Issaquah at 10.40 am; the bus then immediately turns around, leaving at 10.40 am and arriving Bear Creek at 11.13 am (33 minutes) where a 28-minute layover is scheduled. So, after driving for 67 minutes the driver gets a 28-minute rest. All this seems reasonable and not too onerous on the driver but look what happens after that! The 11.41 am from Bear Creek arrives Issaquah at 12.15 pm, 4 minutes after the 12.11 pm leaves for Bear Creek. The 12.15 pm arrival pauses for 26 minutes before the return to Bear Creek at 12.41 pm arriving at 1.14 pm where a further 27-minute rest is scheduled. So now four buses are required and there are 53 minutes of rest between 67 minutes of driving. This pattern of about 44% of time resting continues until the 4.08 pm from Bear Creek which arrives Issaquah at 4.42 pm and then returns immediately, without any rest break, arriving back at Bear Creek at 5.15 pm before a 22-minute break. This allows a reversion to three buses only with rests of around 25% of total time. Is there any good reason to bring on that fourth bus for about 4½ hours? The schedule would only require very minor tweaking to give drivers at least 20 minutes at Bear Creek all through the day, after 1 hour and a few minutes for the return trips. Or if the drivers do need a little more time, minimum rest times of perhaps 25-30 minutes might mean headways drop from around 30 to 35 minutes in the middle of the day. When introduced in March 2018 the Saturday 269 attracted very few passengers. However, ridership is now marginally higher as people begin to realize that the service exists. In this respect King County Metro could do a bit better. The posted schedules at Bear Creek, Sammamish and Issaquah Park and Rides all state quite clearly, “Monday to Friday only”. The other point on the Saturday route with a posted schedule is at the 228th Ave NE and SE 10th Street stop. Here the northbound stop schedule also states, “Monday to Friday only”, but the southbound stop schedule shows the Saturday schedule in full. How is it that the personnel preparing and posting these at stop schedules don’t notice inconsistences between what is displayed at different stops? The Redmond Loop is a shuttle service formed by a partnership between the city of Redmond and King County Metro; it is operated by Hopelink. The service was introduced during 2017. I have taken three rides on this service and observed it passing by on perhaps another 20 odd occasions. Other than my three rides only a couple of times have I noted a rider. Perhaps it is no great surprise that the on-line King Metro schedule for Redmond Loop states “Last day of operation is 12-28-18”. There are probably several reasons for this very sparse ridership. The vehicle used is a four-passenger Dodge sedan car which just doesn’t look like a public transit vehicle even with “Redmond Loop” emblazoned on the side. The Redmond Loop stops are not standard King County with route and destination clearly displayed. Instead there is a tiny easily missed logo. At Bear Creek (and possibly at Redmond Transit Center) no schedule is posted, but all other services at that park and ride are posted. Then, was any thought given to the possible market? Perhaps one anticipated use was to connect with Sound Transit and other services at Redmond and Bear Creek. But riders alighting from a 545 or Rapid Ride at Redmond may not always find a 45-minute headway a very convenient alternative to a more frequent 221 or a fairly short walk. Consider the individual boarding somewhere in Education Hill headed for one of the business areas en route; for example to the Target, Fred Meyer etc. complex near to Bear Creek or to Redmond Town Center (and the Redmond Loop is the only transit service serving the Town Center almost directly). Could be quite convenient, but not for the return journey. The Loop is one way only (clockwise); so to return from Target or Town Centre a rider would have to board the Loop and disembark at Redmond Transit Center and then wait 15 minutes before reboarding the next trip. Although the planners for this service did not successfully analyze the transit needs correctly, kudos to Redmond City for trying to encourage transit. Can the same be said for Sammamish City? The greatly improved 269 over the last couple of years does not seem to be the result of any interest by the City Council, but to the recognition by King County Metro that a city with a population of 65,000 ought to have rather more than just peak hour commuter services. On March 30 of this year, Mayor Durkan suspended the streetcar expansion project known as the Central City Connector, or CCC. In a statement released three months later, the mayor asked SDOT to “evaluate additional mobility alternatives in order to understand the transportation benefits that would accrue from either a streetcar or an alternative mode of transit”. Here are a couple of ideas for alternatives. The CCC would add five new stops along First Avenue, and connect the two existing streetcar lines. For much of the 1.2 mile addition, the streetcar would run in its own center lane. The initial service plan consists of overlapping the two existing lines, so that the streetcars would run more often on First Avenue. Since each streetcar line would run every ten minutes during peak, that would enable five minute frequency in the shared segment. It is important to note that the peak five minute service is only average. Since the trains will start at two different spots and the First Hill train is routinely delayed, it is likely that you will see waits that are longer than five minutes, even during peak. A short distance, looping route like the completed streetcar line is sometimes called a circulator, and is often found in small cities and towns that lack an extensive transit network. In addition to the overall loop, the First Hill segment makes an additional button hook before it reaches downtown. Both circulators in general and routes that are short, squiggly and looping are often criticized by transit professionals. The particulars are complicated, but the basic problem is that it doesn’t make sense to use it for longer trips, since it doubles back on itself. For example, even if the CCC is completed, it will be faster to walk from Yesler Terrace to First Avenue than use the streetcar. That means that a rider from First Hill who is headed to somewhere on First Avenue could get off the train, walk several blocks, and then take the exact same streetcar as it caught up to them. This sort of circuitous routing means that people will find better, more straightforward transit options for their trips. The first alternative is fairly simple: Take the right of way granted for the CCC project, but run buses there instead. 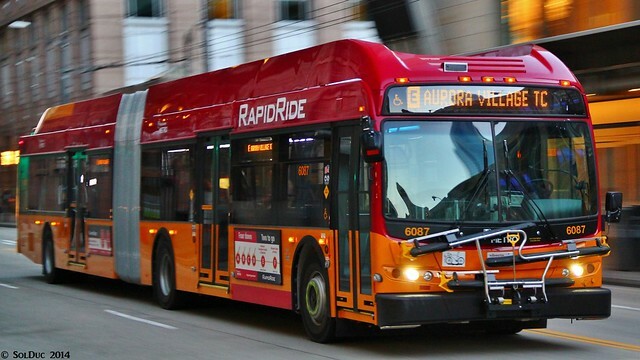 Buses with doors on both sides would have to be used, which means running the so called RapidRide+ routes on First Avenue. 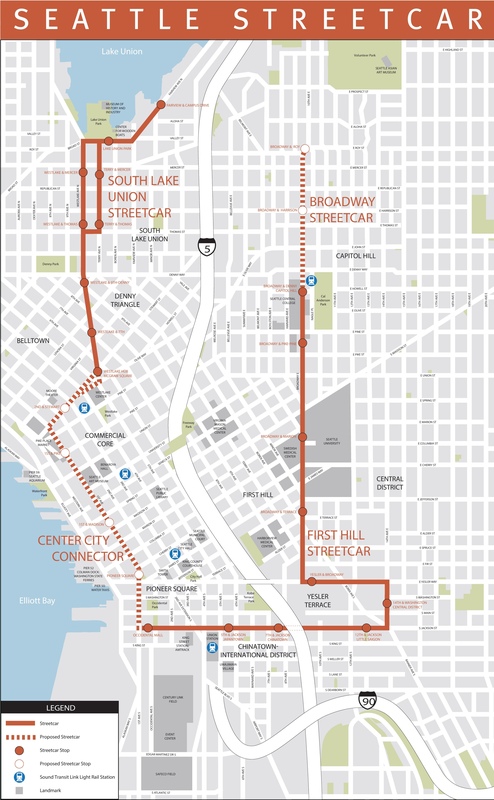 There are several possible routes, but I think the 7 and 70 would be ideal (these are referred to as Corridor 3 and 7 in the RapidRide+ documents). Send them both over to First Avenue in an overlapping manner (similar to the proposed streetcar service plan). The combined service (along First Avenue) would be better, because each line is very popular right now (unlike the existing streetcars) and already has more frequent service than the proposed streetcar. The routing would also connect to more places. Unlike the streetcar routing, any trip along there makes sense (trips like Eastlake to Pioneer Square or Rainier Avenue to Pike Place). Thus there would not only be more frequent service along First Avenue, but more frequent service to more places. Buses would enable faster, more consistent operations. A bus can avoid an obstacle, and the city can more easily and cheaply make improvements to reduce bottlenecks with bus routes. One of the big advantages to this approach is cost. It isn’t cheap to build the center platforms and purchase the dual sided buses, but it is still cheaper than adding rail. But the big savings come from the operations. This would cost almost nothing to operate, as these buses have to travel from one end of downtown to the other anyway. The second proposal is even simpler. Just add BAT lanes along First Avenue, and move a few buses over there. There are plenty of buses that could easily use First Avenue, while retaining very good connections to other parts of downtown. BAT lanes are not ideal — cars can clog a lane while turning right — but it is still a big improvement over regular traffic. Fourth Avenue carries dozens of buses in BAT lanes, and it functions without major problems. It is likely that the maneuverability, added frequency and better routing of buses would more than make up for the difference between BAT lanes and exclusive transit lanes. This alternative could be implemented very quickly. Over time, this alternative could easily evolve into the other one, as we purchase more buses with dual sided doors. My own preference is for the first approach. Running dual sided buses on First Avenue (in a center lane) makes a lot of sense given the amount of effort that has gone into this project. It is quite possible that grant money could be transferred as it was when Providence switched from a streetcar to BRT. Rides would be faster, more frequent and connect to more places. But even just using BAT lanes and regular buses would be a step up from the proposed plan, and it could be done very quickly, for very little money. The mayor is soliciting input with this project. You can contact her at jenny.durkan@seattle.gov. Here’s a whirlwind trip I took this morning using an $8.00 Day Pass. For a more relaxing itinerary would suggest a stop on Vashon for breakfast, a stroll along the waterfront at Pt. Defiance and some time in downtown to explore the wonders of Tacoma. There are additional northbound Sounder trips at 4:06pm, 4:30pm and 5:15pm and plenty of trips from Tacoma to Seattle on Sound Transit Route 594. The Rogue Valley region of southwest Oregon is a very challenging place to visit without a car. Medford is the largest city (pop. 80,000) and the only place with commercial air service. Klamath Falls (pop. 21,500), located about 75 miles east of Medford, has once-daily passenger rail service in each direction via the Coast Starlight. Ashland (pop.21,600) is the home of the Oregon Shakespeare Festival and Southern Oregon University but Ashland has no airport or rail service. Nevertheless, despite the distances that separate the population centers and the low overall population density, there is a basic public transportation system that stitches together the communities of the Rogue Valley. Just be sure to carefully plan your trip if you hope to use the public transit system. The local transit system is operated by the Rogue Valley Transportation District. The RVTD provides bus service on 8 routes, all running through the Front Street Transit station in downtown Medford. The service pattern is based on half-hourly pulses and most routes start at 5am and run until about 9pm. Three of the routes have 60 minute headways, 4 routes run every 30 minutes and the route that connects Medford with Ashland and Southern Oregon University runs every 20 minutes on weekdays. On Saturday, all routes operate hourly and there is no Sunday service. Service to the Medford airport runs every 60 minutes. Unfortunately, land use patterns in Medford are pretty typical of many mid-sized American cities. On the list of US metropolitan cities, Medford ranks #206, which is very similar to Bellingham (#201). Medford’s downtown core is one-way main aterials mostly lined with bars, antique malls, pawn shops and empty storefronts. There is no visible urban revitalization movement in central Medford and the only new businesses that are locating near downtown Medford are the cannabis retailers. Shopping malls with big box national retailers are still under construction on the edges of town as Medford sprawls into the adjacent farmlands. Meanwhile the local transit system is centered on the disused downtown transit center. The picture in Ashland is more hopeful. Shakespeare attracts over 400,000 visitors a year to the centrally located theaters and the adjacent downtown streets and parks are active and full of pedestrians. Yes, the local economy is based largely on tourism, but Ashland seems to elevate the experience above the level of “tourist trap”. Hotels, restaurants and shopping are all located within walking distance of the OSF theaters. The RVTD route that serves Ashland, SOU and Medford is the only route that offers somewhat frequent service. From downtown Medford there is a once-a-day bus line to Klamath Falls, Southwest POINT. The route is managed by the Oregon DOT. Arrival and departure times in Klamath Falls are convenient for Coast Starlight passenger connecting to/from California. Riding to/from the north will require overnight stays in Klamath Falls. Medford and Grants Pass are connected 5 times on weekdays by the Rogue Valley Commuter Line. Greyhound also offers 4 daily trips to Eugene (220am, 505am, 905am, 405pm) with a scheduled trip time of 3:30 to 3:45. Car-free travel to the Rogue Valley is possible, but it requires some careful planning ahead of time. You can fly into Medford but I would recommend staying in Ashland where there are more car-free options. Using Amtrak round trip from Seattle would require 2 overnight stays in Klamath Falls or long bus rides to/from Eugene. In 2024, a new rapid transit line will connect to cities along I-405 every 10 minutes, providing direct service as far as Lynnwood and Burien. But there’s one big problem: the stations aren’t close to where people need to go. Consider the proposed station at NE 85th St in Kirkland: the BRT station is separated from Downtown Kirkland by a mile-long hill that climbs the equivalent of 22 flights of stairs, a 40-minute round-trip journey for a fit and capable walker. Sound Transit’s proposed solution is to build a set of bus lanes between 405 and the edge of Downtown Kirkland–throwing $50,000,000 at the least congested segment of the connection, mind you. To travel to or from the station, you’ll spend probably 5 to 10 minutes waiting for the shuttle, and another 5 to 10 minutes for the bus to trundle along thru Downtown Kirkland traffic, just like everyone else. Isn’t there a better way? Something that’s more pleasant, or maybe even beautiful, fun, distinctive, or inspirational? Instead, imagine…stepping into an aerial gondola for a four-minute ride with a glorious view of Downtown Kirkland and Lake Washington. Or glide down the hill on your bike, and then roll your bike into the gondola to return to the top of the hill. You know what’s even more amazing? It seems that many on Kirkland’s City Council are already on board with this idea, including Dave Asher, Penny Sweet, and Mayor Amy Walen. Kirkland’s City Manager, Kurt Triplett, has been promoting creative transportation strategies like this for years, and is also excited about the possibility of this aerial connector. But providing a great connection at one station isn’t enough. We need to think creatively about how to create effective connections between BRT and the places where people need to go, all along this route. How do we create more efficient connections to stations in Bothell? Renton? And Woodinville? Would you rather trundle along in another bus…or enjoy a unique view of our lovely city from above? Which of these will bring more people to businesses in our urban centers? Which of these will actually compel our residents, customers, employees, and visitors to ride transit instead of further clogging our streets…or taking yet another parking spot? Or maybe you have a better idea? Perhaps a series of covered escalators and walkways? Or just some frequent automated electric shuttles? Maybe some kind of monorail? A mini-metro? Or a cable car on an elevated steel truss guideway? Whatever it is, surely we can do better than just another bus. On March 16th, the two downward escalators between the mezzanine and sub-mezzanine at the University of Washington Link Station failed. With only elevators available to move people into the station for four hours, a line snaked around the station. On April 4th, a presentation to Sound Transit’s Operations Committee reviewed the event and discussed changes that could be made to prevent and mitigate future outages. While the presentation recognized the poor customer experience during the event, it described the impact in a strictly qualitative fashion. This is a quantitative assessment of the escalator outage event. Any mitigation or preventative measure is going to have a cost to put in place. Without the ability to assign a cost to the event, it would be difficult to understand which actions should be on the table. This assessment uses a measurement called Spontaneous Accessibility, published in this year’s Transportation Research Record. At a high level, this measurement describes how well an individual can make an unanticipated, unplanned transit trip throughout a given area. From a technical standpoint, it divides an area into a high-resolution grid of sectors. For each sector it computes, for every minute of a time window, the number of other sectors that can be reached within 30 minutes using transit and walking. This yields a heat map of how easily reachable each sector is, as well as a Network Accessibility Ratio that measures the proportion of time-origin-destination combinations that can be reached within 30 minutes against the total number of combinations. By making modifications to the modeled transit network and calculating the change in the Network Accessibility Ratio, it is possible to make a quantitative assessment. To model the outage, Spontaneous Accessibility was computed under two circumstances. The first considers the scheduled transit service within the city of Seattle on March 16th, between 3:30 PM and 7:30 PM. The second uses the same temporal and spatial parameters, but eliminates the University of Washington stop from southbound Link trains. This is not a perfect model of the outage, as customers could still reach trains at UW Station after a substantial wait. Nevertheless, to a person arriving at the station and viewing a long line, the station may be considered effectively unreachable. This analysis yielded a change in Spontaneous Accessibility of -0.339%. A maximum reduction of 12.3% was observed in the vicinity of the Capitol Hill Link station, with other measurable reductions clustered largely around Link stations and a portion of the Aurora Avenue corridor. This Spontaneous Accessibility map shows the distribution of impact. To extract a meaningful cost from the change in Spontaneous Accessibility, it is necessary to bring in some additional data. Over the four-hour period of the outage, there were 1988.28 vehicle-hours of in-service trips serving the city of Seattle. Using King County Metro’s $140.86 cost per vehicle-hour figure as an estimate for operating costs across all transit providers, the cost of in-service trips for the four hour window was approximately $280,069. In the same period, the Network Accessibility Ratio for the unimpaired network would have been 0.10378. Thus $280,069 was necessary to sustain a 0.10378 Network Accessibility Ratio in Seattle over those hours. When impaired, Seattle had a 0.10342 Network Accessibility Ratio. Sustaining this for four hours should cost approximately $279,097. Thus, from a Spontaneous Accessibility standpoint, the cost of the outage was $972. It is important to be cognizant of aspects of the measurement that may distort this value. Because Spontaneous Accessibility is an isochrone-based measurement, it is not sensitive to the outage’s impact on trips that initially would have taken longer than 30 minutes. Spontaneous Accessibility measurement also acts as though riders have perfect knowledge of the transit network. Actual riders may not be aware of the other options that they have for completing their journeys, and thus may queue at the station instead of finding alternatives. Even if riders were to have this knowledge, Spontaneous Accessibility does not incorporate vehicle capacity, and thus would not account for alternate routes becoming congested as riders switched to them. Particularly thorny in this case is that Sound Transit would largely be relying on King County Metro to absorb that missing capacity. Any attempt at assigning a single cost to an event is going to have limitations, and this is a basic one using publicly available data, open source software, and back-of-the-envelope math. At this point, however, it describes the impact more quantitatively than Sound Transit has put forth at this time. Sound Transit plans to evaluate certain mitigations by the next Operations Committee meeting on April 20th. These will surely have a price, and it will certainly be interesting to see how they compare to this assessment of the UW escalator event’s cost. Mayor Jenny Durkan, who is presiding over a growing city facing transportation challenges, ended the first quarter of 2018 with a cliffhanger for the streetcar. This, after getting pressure from Bellevue to improve matters for pedestrians after Seattle did not nothing but worse than nothing, leaves a bad impression on Seattle’s leadership. Fortunately, in the time after becoming mayor, Durkan had planned up some “early wins” that can be rolled out in short order that would greatly improve matters, and today the city is launching a much needed improvement in pedestrian walk signals. As you know from experience, most pedestrian walk signals do nothing (except to tell the signal not to stop you from crossing even though you have enough time to cross, but that doesn’t really count). Of course there are a few oddballs where it does make a difference, but these are usually in places where the green signal is normally so short anyway (1-5 seconds) that a push-button is needed to allow enough time for pedestrians. Nothing is more frustrating than running to an intersection and missing the light turning green by half a second and you don’t get your walk signal. Also frustrating is a group of people waiting to cross, just to find that none of them pushed the beg button, and now everyone is waiting another cycle. This is why on April 1st, 2018, Seattle will be rolling out automatic button pushers on all intersections, relieving the frustrations of thousands of pedestrians in a single day. Sure, it’s not anything on the scale of fixing Mount Baker station, but it’s certainly an improvement. Plus the numerous construction projects that close the sidewalk often require pedestrians to zig-zag across major arterials, and this is a helpful mitigation. Never again will you experience the frustration of missing a pedestrian walk signal in Seattle. Lynnwood Link will dramatically alter transit in Snohomish County. There will be substantial savings that come from truncating long distance runs into Seattle, and with that money, the opportunity to better serve the region. This is a proposal for three frequent bus routes that would connect the Lynnwood Transit Center to various parts of Everett. There are three agencies operating in the area: Sound Transit, Community Transit, and Everett Transit. Sound Transit has four routes there. The 513 is rush hour only, and picks up less than 20 people per bus north of Lynnwood. It performs poorly, and is not worth expanding. The 510 and 511 are both rush hour express buses to downtown Seattle. The 510 serves Everett and South Everett stations, while the 511 serves Lynnwood and Ash Way stations. The 512 does not operate during rush hour and essentially serves all of those locations. Those three buses would undergo changes with this proposal. There are numerous buses serving the area. Everett Transit doesn’t go to Lynnwood, but is worth mentioning because it would complement the proposed routes. Community Transit has several routes in the area, but most of them run only every half hour. The 201/202 are an exception. These buses run every 15 minutes from Everett to Mariner, Ash Way (the street as well as the Park and Ride) and Lynnwood. The three ST buses (510, 511 and 512) along with Community Transit 201/202 serve as the basis for this new alignment. The 201 and 202 would retain its existing frequency (15 minutes combined) and simply be truncated at Ash Way Park and Ride. The 510 is largely the same (merely truncated at Lynnwood) but would run frequently all day. The 514 is a new bus that would also run frequently all day. The 511 and 512 would go away. One of the key elements of this proposal is to speed up the travel between Everett and Lynnwood. Sound Transit already does that with the design of the 510 and 511. In both cases, there are bus stops along the way connected to HOV lanes on both ends. This means that buses spend very little time serving those stops. In contrast, because there are no north end ramps connecting the Ash Way transit center to the freeway, the 512 spends extra time dealing with the traffic lights and general purpose lanes. My proposal is to continue the basic idea of the 510/511, but extend it all day long. The bus serving Ash Way (the new 514) does not get on the freeway north of there. It is instead extended to serve the neighborhoods to the north. By overlapping the 201/202, it allows those Community Transit buses to be truncated at Ash Way. If you are headed from Everett TC to Lynnwood, you would take the 510. Between 128th and 164th, you can take the 514 to Lynnwood. The 514 manages to serve most of the densely populated areas north of Lynnwood. It connects with both Swift Lines as well as a lot of Everett Transit and Community Transit buses. It can take advantage of the right of way granted to both Swift lines. For many in the area, it would provide a much faster connection to Lynnwood. Someone on SR 99 who happens to be close to a stop can get to Lynnwood using one bus, instead of three. The bus also provides a little extra service along the two main corridors being served by Swift. While Swift is relatively frequent (12 minutes during the day), adding an extra bus along that line would likely be welcome, and not excessive. 1) Ending at SR 99 and Airport Road. That would provide a lot of people with a fast one seat ride to Lynnwood, while anyone on SR 99 would have a fairly frequent two seat ride. Unfortunately, a lot of people on Casino Road (which is relatively densely populated) would still have an infrequent three seat ride to Lynnwood. It also becomes more difficult to get to Paine Field and the surrounding factories. There are likely to be alternative bus routes, but probably nothing as frequent (because nothing would pass through as many relatively densely populated areas). 2) Ending at SR 99 and Casino Road. A stop here would connect to several Everett Transit bus routes. However, the Community Transit bus routes manage to skip this stop by using the freeway. This means that connecting service to the airport (and surrounding businesses) would not be that frequent. I could easily see how more bus routes could be changed to serve that area (since it is a crossroad) but if you ended at Airport Road and Casino Road, you wouldn’t have to. That connects to just about every bus in the area. Paying for this kind of service could be difficult, but if we considering truncations to the D-line and routes 40 and 62 that are very likely with a Ballard Link restructure, I could see it being done. Hello, this is a plan I came up with for a potential series of future rail expansions for the region. I have also included potential infill stations and changes to station and line names to simplify the system. 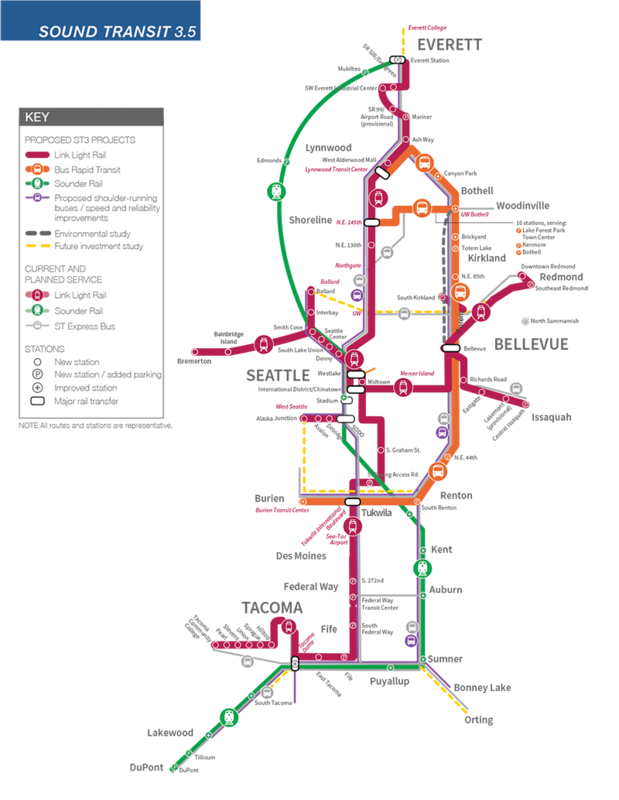 The plan includes Link Light Rail, the Seattle streetcar, and Sounder Commuter Rail. Here is the link to the plan map. Under this proposal, the Seattle Streetcar system would be vastly expanded and essentially be turned into a local light rail system for the City of Seattle. Streetcars would have 100% reserved lanes and signal priority. 4 lines would be built (A,B,C, and D). I hope you enjoyed, and I encourage feedback in the comments.